The "Adam and Eve", Old Chelsea, London. Etching and drypoint on Japan paper with full margins. With the artist's butterfly signature in the sky above the tower. Published in 1879 by Messrs Hogarth & Son, London. References: (K.175) Edward G. Kennedy, The Etched Work of Whistler, New York, The Grolier Club, 1910. (G182). Margaret F. MacDonald, Grischka Petri, Meg Hausberg, and Joanna Meacock, James McNeill Whistler: The Etchings, a catalogue raisonne, University of Glasgow, 2012. The view is taken from the Old Battersea Bridge and shows the square tower of Chelsea Church. "Old Ferry Wharf/J Johnson/Coal Merchant" is written on the three storey building to the right of the church. In the foreground the pub sign reads "The Adam and Eve/Wine & Spirit Establ". 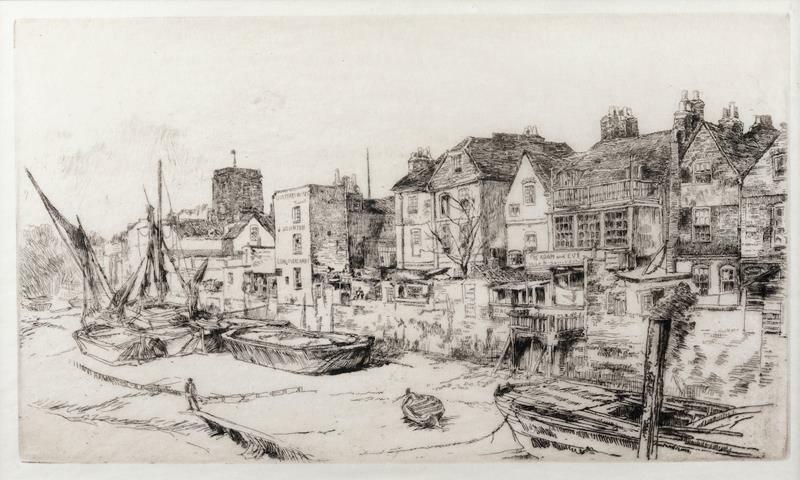 The Adam and Eve was demolished to make way for the Chelsea Embankment just before this etching was produced.